On Sunday, May 1, the town people of Bremen, Indiana, came together to celebrate the preservation work completed on the historic Bremen Train Depot with a ribbon cutting ceremony at 2 PM and with the Bremen High School band performing. B&O (Baltimore and Ohio) built a railroad track across northern Marshall County in 1874. The first depot was wooden and on the northwest side of the east-west railroad track on Center Street four blocks north of the center of Bremen. This brick Train Depot building was built by B&O in 1929 directly across the track from the old depot on Center Street.Local contractor S.G. Lehr was the builder. The depot was dedicated on October 22, 1929, seven days before the stock market crashed. The depot served as a passenger station, a freight office, a Western Union office and a mail station. It provided passenger service until 1971. In May 1987 the depot was officially closed and boarded and left to deteriorate. In 2002, a small group of citizens met and decided to save and restore the depot. Historic Bremen, Inc. was formed, a federal funded Transportation Enhancement grant was obtained, CSX donated the building if moved and the Town of Bremen donated the new site. Work started in the fall of 2008 and the move was completed in 2009. In early 2010 another grant was obtained from INDOT using ARRA funds to complete the restoration project. 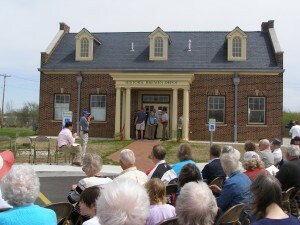 The move and restoration of the depot was completed November 1, 2010. This entry was posted on Tuesday, May 3rd, 2011 at 3:36 pm and is filed under FUN Things to do in Bremen. You can follow any responses to this entry through the RSS 2.0 feed. Both comments and pings are currently closed.